At this month’s South Dakota Festival of Books in Brookings, Sept. 20-23, the South Dakota State Historical Society will release a young adult biography about one of the many forgotten heroines of the women’s suffrage movement. 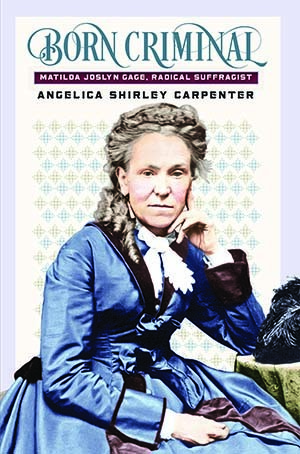 In “Born Criminal: Matilda Joslyn Gage, Radical Suffragist,” author Angelica Shirley Carpenter explores Gage’s life and why she is often overlooked when her comrades, Susan B. Anthony and Elizabeth Cady Stanton, are regularly celebrated. Reflecting upon her 1893 arrest, Gage said, “All of the crimes which I was not guilty of rushed through my mind, but I failed to remember that I was a born criminal—a woman.” What was Gage’s crime? Registering to vote. Prior to 1920, most women in the United States had no voice in who created laws or set their taxes, and they were arrested when they did attempt to cast ballots. By the mid-1800s, Matilda Joslyn Gage (1826–1898), and others like her, thought it was time for change. Gage grew up in New York state in a home on the Underground Railroad, and her early introduction to the movement to abolish slavery made her value all people. When three of her grown children moved to Dakota Territory in the 1880s, Gage took the woman suffrage cause west, traveling from town to town on the frontier, promoting her ideals. At the dedication of the Statue of Liberty in 1886, she helped stage a protest, arguing that a woman could not represent liberty in a country where women were not guaranteed the right to vote. Gage’s ideas were not always popular, and others often viewed her as too radical. Stanton and Anthony, prominent leaders in the suffrage cause, both outlived Matilda Gage and eliminated her from their own histories of the women’s movement. By the time the Nineteenth Amendment to the United States Constitution granted women nationwide the right to vote, Matilda Gage was all but forgotten—until now. “Carpenter’s book is a strong reminder that history is written by the victors. ‘Born Criminal’ is an inspirational portrait of a woman who never gave up the fight for equality; her message could not be more timely or more necessary,” writes May Alexice in “Foreword Reviews” magazine. In South Dakota, women won the right to vote in 1918. Many minority women here and elsewhere, however, were not allowed to vote until after 1920. Carpenter has master’s degrees in education and library science from the University of Illinois. She served as director of the Palm Springs, Fla., Public Library and worked for the Arne Nixon Center for the Study of Children’s Literature at California State University, Fresno. Carpenter currently resides in Fresno and is active in the International Wizard of Oz Club, the Lewis Carroll Society of North America and the Society of Children’s Book Writers and Illustrators. “Born Criminal” is available for $19.95, plus shipping and tax and can be ordered directly from the South Dakota Historical Society Press at sdhspress.com or by calling 605- 773-6009. For more information about the Suffrage Project, call 605-773-6003. Follow the South Dakota Historical Society Press on Facebook (SDHS Press) and Twitter (@sdhspress) for more.